A third Iron Dome battery was stationed near the city of Ashdod today, Wednesday (August 31), protecting its 200,000 civilians of rockets fired from the Gaza Strip. 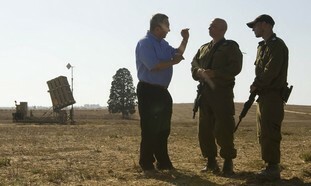 The Chief of the General Staff, Lt. Gen. Benny Gantz in cooperation with Israel Air Defense soldiers, Defense Ministry personnel and defense industries completed the operation sooner than planned. Two other batteries are already protecting the cities of Ashkelon and Be'er Sehva, a total of 300,000 civilians. "I want to thank everyone who took on the challenge and successfully stationed a third operational Iron Dome battery, even before the school year commenced," said Defense Minister Ehud Barak. "This is part of the national emergency plan I declared several weeks ago and a tangible method to defend Israeli civilians from rockets and missiles." Earlier this week, Defense Minister Barak said that by the end of the year a fourth battery will be employed and a total of nine will be operational within the next two years. According to Barak, stationing batteries will "revamp the security of Israeli residents who are still in need of shelters." Note: Keep on praying for Gods protection over Gods people in Gods Land! Een Israëlische rabbijn heeft een groep inwoners van het Spaanse eiland Mallorca als Joods bestempeld. De Chuetas van Palma de Mallocra stammen af van de Joodse eilandbewoners die zeshonderd jaar geleden gedwongen werden om zich tot het katholiscisme te bekeren. Een groot deel van deze afstammelingen kunnen hun afkomst natrekken tot aan hun voorouders die destijds werden vermoord omdat ze het Jodendom bleven praktiseren. Er werd een rabbijn naar het eiland gestuurd om de afstamming van de leden van Chuetasgemeenschap te onderzoeken. Daarbij kwam aan het licht dat deze groep, die twintigduizendleden telt, een hechte band met elkaar behielden maar ook dat de meeste onder hen een van de vijftien belangrijkste Chuetafamilienamen dragen. Nissim Karelitz, een orthodoxe rabbijn zei tegen de Jeruzalem Post: “Het staat vast dat de Chuetas tot op de dag van vandaag het gebruik in stand houden om enkel te trouwen met leden van de eigen gemeenschap. Daardoor zijn diegenen die verwant zijn met die vorige generaties ook nu wel degelijk Jood”. De Chuetas – het woord is afgeleid van het Catalaans voor varken – werden ongenadig hard vervolgd in de Middeleeuwen. Rond 1435 waren ze zonder uitzondering allemaal bekeerd tot het katholicisme of vermoord. Niettegenstaande de gedwongen bekeringen bleef het hen verboden om met andere katholieken te trouwen en bleven een groot aantal beroepen voor hen eeuwenlang ontoegankelijk. Wil je de Palestijnen ècht helpen en het vluchtelingenprobleem eens en voor altijd oplossen? 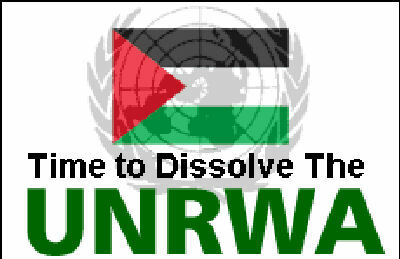 Help de UNRWA opdoeken – NU ! De tijd dringt dat de multinationale FABRIEK van de UNRWA wordt gesloten en haar ruim 30.000 [Palestijnse] werknemers een andere baan zoeken. Een wereldinstituut zoals de UNRWA, dat na 62 jaar nog altijd het probleem niet heeft opgelost waarvoor het werd opgericht [de Palestijnse vluchtelingenkwestie] heeft gefaald en heeft geen enkele bestaansreden meer. Integendeel, alles wijst erop dat de UNRWA het Palestijnse vluchtelingenprobleem kunstmatig in stand houdt om haar eigen voortbestaan als instituut [en als werkgever voor 30.000 Palestijnse vluchtelingen] ook in de toekomst te betonneren. Dat los van het feit dat de Palestijnse vluchtelingen, met medeweten van alle internationale instellingen, ngo’s en mensenrechtenorganisaties, schaamteloos worden misbruikt als inzet om Israël te vernietigen [lees verder]. Want iedereen die kan tellen, weet dat wanneer Israël ooit verplicht zou worden om 4,7 miljoen islamitische nakomelingen van zogeheten Palestijnse ‘vluchtelingen’ zou moeten opvangen en huisvesten – het gekende demografische wapen – dit de facto het einde van Israël inluidt. En dat is precies het enige doel van die ‘terugkeer’ en waar Palestijnen, maar in het bijzonder Arabieren en Perzen op uit zijn. Want in werkelijkheid geeft geen enkele Arabier of moslim om het lot van de Palestijnse vluchtelingen. Het beste bewijs is hoe zij die Palestijnen al 62 jaar behandelen – lees: mishandelen en discrimineren – in hun eigen vluchtelingenkampen die ze als een open etterende wonde, als aanklacht tegen Israël in stand houden. Elk ander beschaafd land had er nooit 62 jaar over gedaan om haar vluchtelingen een menswaardig bestaan te geven, fatsoenlijk op te vangen en maatschappelijk te integreren. 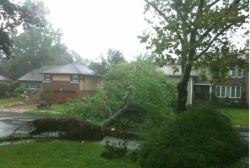 A New York rabbi was electrocuted to death while trying to save an eight-year-old neighbor boy trapped under a live cable that was downed by hurricane Irene Sunday, according to Yeshiva World News. The boy is in critical condition. Rabbi Moshe Yosef Reichenberg of Monsey was driving when he noticed the boy trapped under the cable. He stopped his car and tried to rescue the child, but was killed by the high voltage without being able to free the child. ”It was a horrible scene,” wrote Meir Bernstein of New York’s Kol Hareidi newspaper. Rescue teams tried to save the rabbi’s life and rescue the child but were forced to stand by helplessly for 20 minutes until electric company crews arrived to cut off the power. By then it was too late to save the rabbi. The stormy weather also did not allow a helicopter to land and evacuate the victims, and the child had to wait for half an hour until an ambulance was able to rush him to a Westchester hospital, where doctors said his life is in danger. People are asked to pray for Chaim Reuven Dovid ben Chava Leah. It should come as no surprise to Christians that baptism didn’t originate with Yeshua’s disciple John, who was known as “John the Baptist.” Baptism was and is a Biblical ritual called tevilah, more commonly known as mikvah, that’s been practiced regularly by all Israel since the days of Moses. In the Torah, when Jewish men went to the Temple three times a year, Pesach (Passover), Shavuot (Pentecost), and Succot (Feast of Tabernacles), they would go into the mikvah before entering the Temple to offer their sacrifices. The waters of mikvah play an important role in Judaism today as well, from pre-marriage and pre-Yom Kippur preparations to the purification of menstruant women. The Chassidim (ultra-orthodox Jewish men) go to the mikvah before shabbat, and some even go every morning during the week. For the observant Jew, the mikvah personifies both the womb and the grave and consequently, rebirth. It is regarded as a pure, unadulterated avenue of connection with God and for that reason it is a place where hope is reawakened and strengthened. The word baptism comes from the Greek work Baptidzo which primarily means a thorough change of condition accomplished through immersion. It is substituted for the Hebrew word tevilah (“to totally immerse”). Yardenit on the Jordan River may be the place where Yochanan immersed Yeshua. Tevilah marks a change of status from being tamay to tahor—ritually unclean (impure or unfit for the presence of God) to ritually clean, since anytime a person is to come into the presence of God, they must come tahor (pure). Mikvah, therefore, is commanded in Scripture for a number of common life events. Scripture instructs that anyone who becomes ritually unclean through contact with a dead or diseased person needs to be immersed in water before re-entering the Temple. A mikvah was also to take place after a leper had been declared healed by the priest. This commandment is still observed today. The rabbis explain that this period of abstinence, called the niddah period, teaches husbands and wives the need for discipline, respect and moderation. In the most traditional Jewish mikvah, a woman must thoroughly wash her entire body, even down to her finger and toenails before entering the mikvah. Today one of the most widely practiced uses of the mikvah is in the pre-wedding preparation of the bride and groom. It’s a way of becoming ritually pure before the marriage. There is no better way to enter a marriage than to start off being pure! The bride is immersed as close to the wedding as possible, even on the afternoon before the ceremony. It’s customary for Chassidic men to go to the mikvah before their wedding, and today many Orthodox Jewish have also taken on this custom. Jewish men dance the hora after the groom’s pre-marriage mikvah. Obviously, the primary significance of the mikvah isn’t for physical cleansing, but spiritual. A mikvah was often a body of natural water such as a river, lake, spring, or any naturally fed gathering of water. Over time, however, it became common to construct special pools. All worshippers going up to the Temple were required to immerse themselves first in the mikvah. It was forbidden to come into the presence of God in the Temple without first passing through a mikvah. Recent archaeological digs in Israel have revealed several Mikvot (plural) in the second temple compound, as well as in the Judean desert, built by the Qumrancommunity (The Essenes). Modern-day visitors to Jerusalem can see the remains of these ritual baths throughout the Southern wall excavations. There are immersion baths at Massada, at the Herodian, at Qumran, and all over the Land of Israel. This late Second Temple period Mikveh is in Herodium. An interesting application of the mikvah is the practice of tevilah for Gentile converts to Judaism. 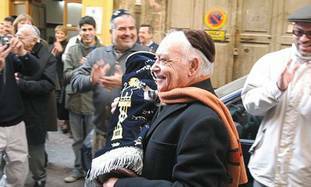 Circumcision and mikvah are important when a Gentile man converts to Judaism. A man who wants to become Jewish must undergo the two main requirements of circumcision and immersion. A woman, however, must only be immersed. When Gentile converts go down into the waters of the mikvah, they leave behind their pagan ways– symbolically dying to their old life – and come up out of the water as a newborn child with an entire new identity. They are in essence reborn. 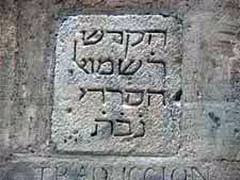 Understanding that the term born again referred to conversion to Judaism sheds light on the conversation between Yeshua and the sage Nicodemus in the book of Yochanan (John). He was explaining to Nicodemus that we cannot rely on our ‘Jewishness’ (or any other heritage) to enter the kingdom of heaven. A conversion of the heart is necessary for salvation. Judaism regards the mikvah as a symbolic expression of re-birth. The mikvah represents the mother’s womb, which is called in Hebrew rechem. This comes from the same root as the Hebrew word for mercy (rahamah). Immersing fully into the waters of the mikvah is like re-entering the womb, the place of mercy; of God’s creative power. Emerging from the mikvah is like being born again. Immersion in a mikvah also represents death and resurrection. A person under water enters a death-like state, like a person descending into a grave. When he comes back out of the water, he comes back to life as a new creation. When we are immersed into Yeshua Hamashiach (the Messiah), we also become a new creation. The Jordan River is a popular place for Christians who are visiting Israel to be baptised. In Hebrew, the word mikvah has the same root letters as the word hope! When Believers are immersed in the waters of the mikvah, as a declaration of faith in Yeshua, they have the hope of a new life, a new beginning in Him. According to history and the bible, the Jordan River is the exact site of the baptism, called the Baptism site. Jordania as the place where Yeshua was immersed by Yochanan (John). In the Brit Chadasha (New Testament), Yochanan (John) immersed people in the Jordan River. His message of turn and repent is the message of Teshuvah! to mend our ways and turn back to God. Teshuvah is a familiar message during the High Holy Days of Rosh Hashanah (New Year) and Yom Kippur (Day of Atonement). During these Feasts of the Lord, Israel is to assess her spiritual condition and turn back to God. The chronology in the gospels reveals that Yochanan’s arrival took place in the fall, which is the time for these feasts. The mikvah would have been a sign of inward cleansing in spiritual preparation for the Holy Days. Yeshua himself entered the waters of mikvah at this time. It is evident from Yeshua’s final instructions that tevilah or mikvah would be part of making all the Gentile nations into Talmidim (disciples) of the Jewish Messiah. May you experience great joy as you are cleansed and transformed by the power of His Holy Spirit through tevilah in the mikvah. 'Niet meer zwijgend' over Israël en Jeruzalem! Israel the new petro state?